The picture needs a bit of explanation. Worthington Kilbourne Assistant Principal Kevin Johnson had an idea that he thought he would run by his acquaintance, Judge Michael H. Watson of the US District Court, Southern District of Ohio. Would it be possible for Judge Watson to have a United States Citizenship Naturalization Ceremony in a public high school? After many meetings between Mr. Johnson and the Judge's staff, it came to pass and that event happened today. 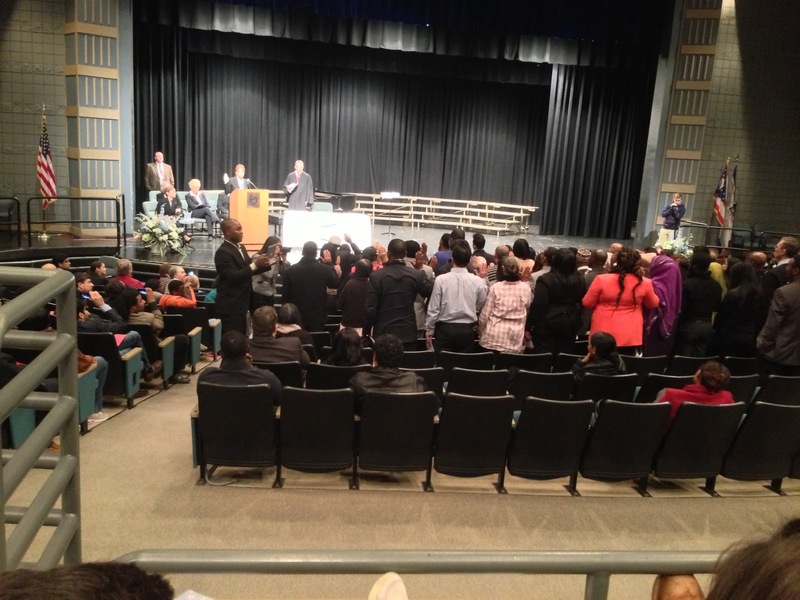 Seventy individuals as young as 18 and as old as 82 filed into the WKHS auditorium to take the oath of citizenship (pictured above) and become United States Citizens. 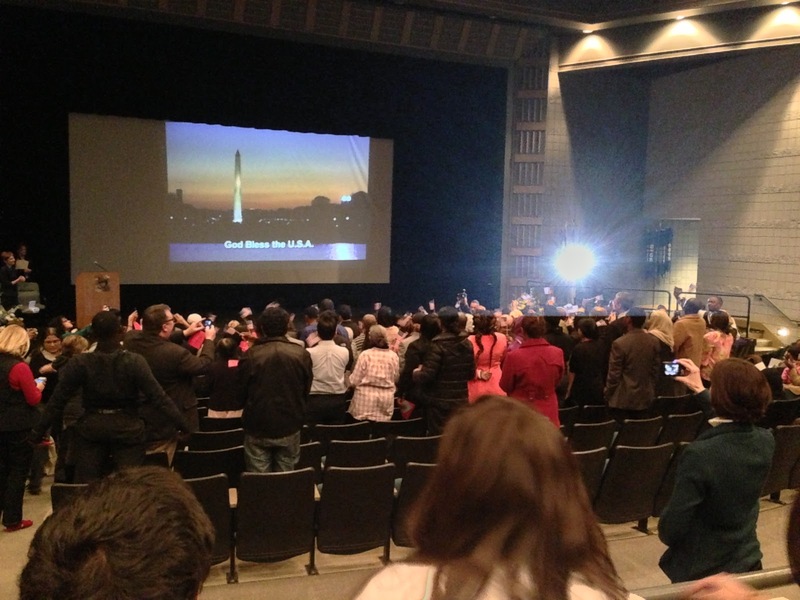 Watching them along with family and friends were hundreds of high school seniors getting what had to be the civics lesson of a lifetime. These people came to our country, for some, decades ago and have been pursuing citizenship in some cases for years. For them, today was the culmination of a dream. Judge Watson asked each person to state what citizenship meant to them. For some, it meant the gaining of the same rights as all Americans have. For others, it meant joining their family as citizens. What our students witnessed were people who worked hard and played by the rules, all to get something which they obtained, for the most part, simply by being born in this country. It is unlikely that these kids (or the adults) will view their status as American citizens in quite the same way. Mr. Johnson organized quite a show, including "The Star Spangled Banner" from the WKHS marching band, America the Beautiful from the WKHS choir and a fantastic keynote address from WKHS parent Reverend Timothy Ahrens. Reverend Ahrens noted that most of us are second or third generation Americans whose parents or grandparents or great grandparents came from somewhere else. The ceremony concluded with a rendition of "Proud to be an American" which was meant to be only on video but wound up being sung spontaneously by everyone in attendance. The Dispatch covered the event. What was learned this morning won't show up on the state report card and can't be assessed by a proficiency test, but in my opinion, was as important a learning experience as anything our seniors will experience this year. Thanks to WKHS Assistant Principal Kevin Johnson and the entire WKHS team for making it happen. To the credit of our Board of Education and our adminstration, past and present, we are collectively very big on keeping promises that our district makes to the community, especially with regard to levies. For example, in 2006, we passed a "no additional millage" bond levy promising that taxes would never increase above the 3.8 mill rate that taxpayers were already paying. As it happens, bond issues in the state of Ohio are open ended commitments on the part of the taxpayer and the county auditor at the time authorized us to increase the millage above the 3.8 mills. Worthington Schools said no to the additional millage (and money) and to this day, we've kept that promise. Fast forward to 2012. In numerous community conversations and in any number of personal discussions, district officials and board members (including me) pointed at the necessity of bandwidth expansion in our buildings as one reason for the technology component of the bond levy. It is clear that high speed, universal and unconstrained access to the Internet will be a requirement in all Worthington Schools buildings moving forward. After passage of the bond issue and issuance of the bonds, the district formed a bandwidth committee on which I was privileged to participate, and we began to explore options. That's when we discovered that it was in the best interests of Worthington taxpayers for our district to break a promise. Allow me to explain. The federal government runs a program called e-rate. As part of that program, school districts can apply for reimbursement of technology expenditures based on the percentage of economically disadvantaged students attending school in the district. We anticipate that through the e-rate program, the federal government might pay up to 50% of the costs of the bandwidth expansion. Since the bandwidth expansion is projected to cost 1.5 million dollars up front, we are talking about a significant amount of money. Unfortunately, in order to qualify for the e-rate reimbursement, we discovered that we cannot purchase the fiber outright as a capital improvement, it must be purchased as a service. Ohio law says you cannot pay for a service out of bond funds, therefore, for our purposes, the rules of e-rate funding were inconsistent with the rules for what you can pay for with bond funds. If we kept our promise and used bond funds for the bandwidth expansion, we would be turning down up to $750K in federal money. At the March 11, 2013 board meeting, we made the decision to pay for the bandwidth expansion primarily out of the interest earnings that were accumulated off of the 2006 bond issue. These funds, while not part of the general fund, could have been transferred into the general fund so they are essentially unrestricted funds. In doing so, we qualify for e-rate reimbursement, essentially cutting the local cost of fiber / bandwidth expansion by up to 50%. I am loathe to break promises made during a levy campaign, however, I felt that if Worthington School District residents had this information, they would agree with our conclusions. There are two open questions. First, since we didn't spend the 2 million dollars we allocated towards bandwidth, we still have those funds available in the technology portion of the bond fund. We can keep them there or move them into a contingency fund, perhaps stretching the bond levy out another year. Second, we will be receiving federal e-rate reimbursement payments over the next 3 years. That money could be deposited into the general fund or it can be used to pay bills. Both questions will be discussed at the next Treasurer's Advisory Committee meeting. This blog post is in the interests of full transparency on what was done and why.